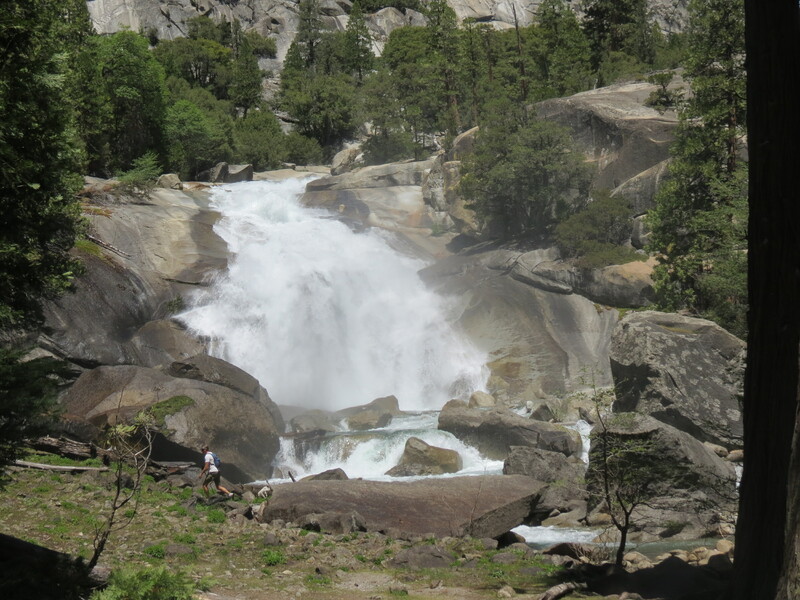 Mist Falls - Kings Canyon National Park - Beyond Limits on Foot! One of the main reasons we left at 5 am in the morning from Redondo Beach was to be able to hit this hike and still get to our campsite at a normal time. To get there you take the 180 all the way to “Road’s End”. The trailhead is right by the Wilderness Ranger Station and there is plenty of parking around. You don’t have to stop by the Station unless you are backpacking or if you have questions. The road down to Road’s End is extremely beautiful and even if you don’t do this hike, I would definitely take the drive down there as the windy road, granite walls and spectacular views produce something well worth it to view. 11:00 am start: The hike itself begins with no elevation gain; there were plenty of families with kids around also. On the way up we heard a couple children ask if there was any water at the falls; funny question because the river was absolutely roaring from the excess water next to us. This time of year is the best to go to hikes with waterfalls because the snow melts away and creates a spectacular view. The first couple miles we witnessed the Kings River’s forceful flow; stay away from the edge of the river. After 1.9 miles you will hit a fork in the road, make sure you follow the sign to Mist Falls (2.7 miles left) and not towards Sphinx Creek or Junction Meadow. This part of the hike is a 1,000 foot elevation gain, with slabs of rocks and views that can be stared at for hours. This portion of the hike you run into shaded forested areas, but feel the sun’s warmth as you hit the rocky area, where there are many photograph opportunities with the valley below and the mountains of granite soaring above. It almost felt as though we were in a rain forest due to the amount of water and mass of the trees surrounding. We passed meadows, small cascades and enormous trees looking down at the hikers below. The last stretch to Mist Falls felt as though we were looking for something hidden. Finally we saw some white pier through the trees and as we got closer, we felt the mist of the falls come through and cool us off. We arrived around 12:15 pm to the falls and took a breather on the bank of the river a little downstream from the falls. After lunch, we headed back to the car. The one disappointing thing about this hike is that it’s not a loop, though it didn’t matter because we were free in the clear air and the surrounding areas made us always take a second look at its beauty. Note to self: Bring more water as the elevation can get to you.